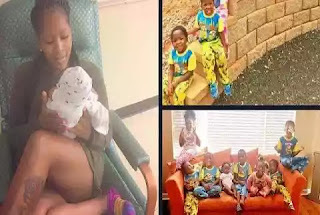 PeopleNews Network: The 25-Year-Old Lady Who Already Has 9 Children! While some ladies are still struggling to be in any kind of serious relationship at 25, a photo of a yet-to-be-identified lady has emerged and gone viral on the internet as it is believed that she has already had 9 children at the tender age of 25 (as of the time the photos were published). In the undated reports, it was learnt that the said lady delivered the kids as a set of triplets, a set of twins, and four single births. According to multiple online outlets, the pictures – which she was said to have first published on Instagram – did not really indicate if she’s married. She, however, made motherhood look unusually adorable! ”I see lawyers, doctors & athletes,” she was quoted to have written on a post.